Take a wondrous river cruise through beautiful France along the guided sightseeing in the well-known French treasures and some hidden gems too! 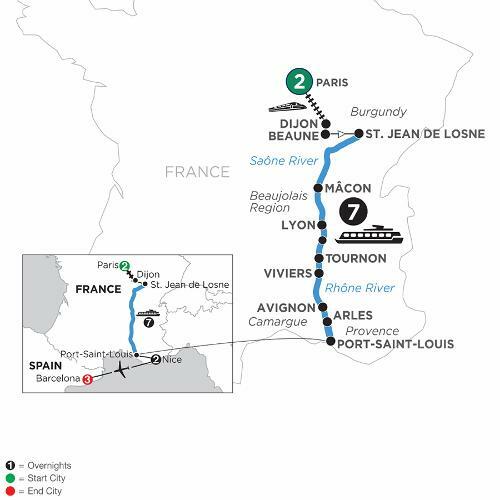 This French vacation on the Rhône and Saône Rivers begins with two nights in Paris. In the “City of Lights”—home to Notre Dame Cathedral, the Eiffel Tower, and the Louvre Museum—you’ll enjoy a sightseeing tour of the city’s must-see sights. A Master of Wine will travel with you on this cruise and will hold lectures, tastings and introduce you to food and wine pairing. Your French river cruise portion of your guided vacation ends with an overnight stay on the picturesque Côte d’Azur. Fly from Nice to Barcelona, see the Passeig de Gràcia, La Pedrera, and go inside Gaudi’s Casa Batlló, and Sagrada Familia Basilica, with ample free time—part of your Monograms vacation package in Spain—with an expert Monograms Local Host® available to you throughout your stay in Barcelona.